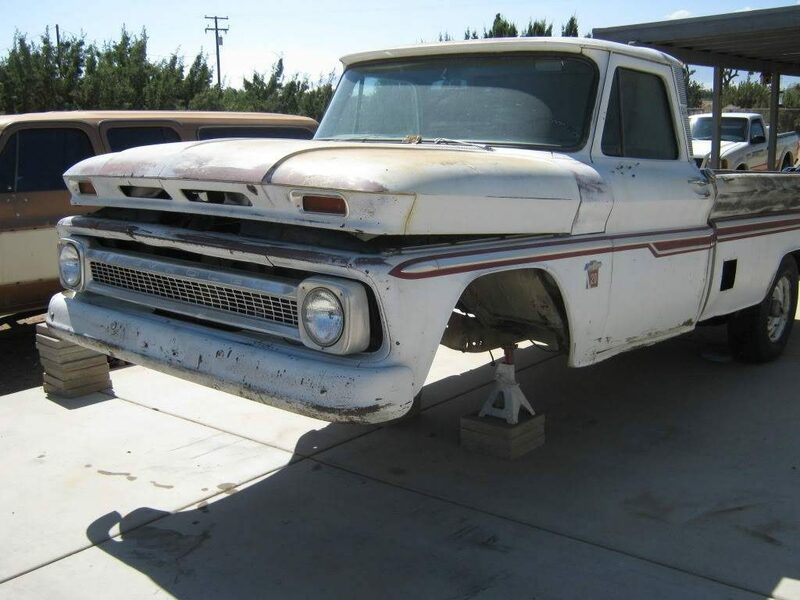 Welcome to Part Four of the Project White Trash series; an on-going story highlighting the resurrection of a 1964 Chevy truck that was rescued from the scrapper. Before we continue with this story, I have to make a statement: I’ve never wanted to build a customized long bed. Up to now, every truck that I’ve ever customized was always a short bed. Long beds are awesome, but I’ve always viewed them as work trucks. I’ve had a couple of them in the past and absolutely loved them, but not in the hot rod sense. There are many long beds out there that have been modified in the traditional lowrider style, but it’s a rare sight to see one done up like a hot rod. 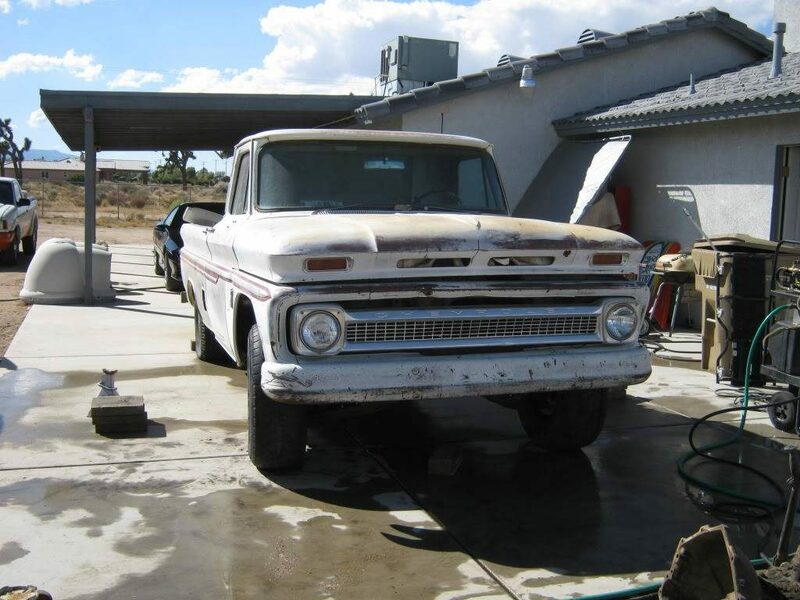 The intent of this truck from the start was to build something cool on a limited budget. Most every aftermarket suspension part for a GM truck will fit either a short bed or a long bed, so why not give it a shot? I accepted the challenge. I was going to build this wiped-out long bed into a hot rod using all of the tricks that I’ve used in the past. Plus, I had a few ideas that I’ve always wanted to do, and this is the perfect truck to try them on. In the last few years, the C-10 world has exploded. One of the areas that has seen incredible progress is the development of suspension components. 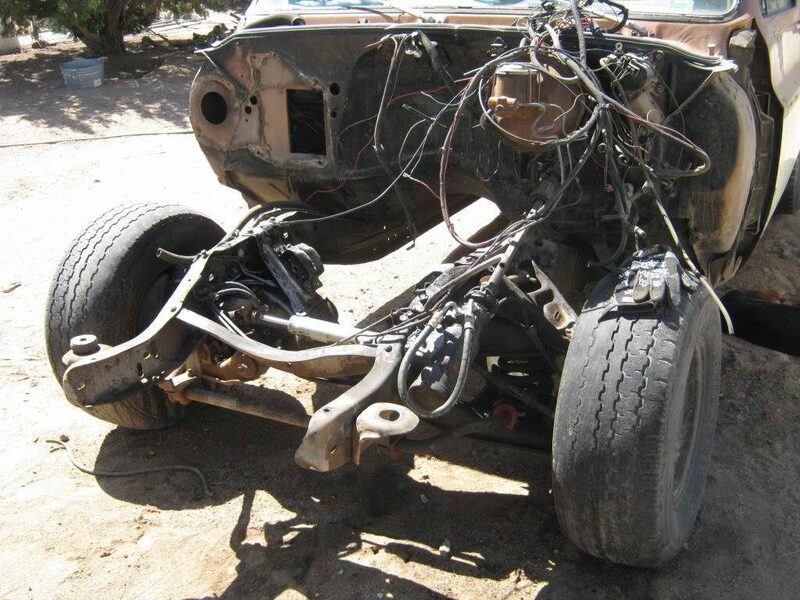 Today, you can buy a complete chassis with high tech components from companies like Morrison or The Roadster Shop. I have drooled over these incredible parts for a while, but unfortunately, they just aren’t in my budget. My limited budget isn’t a dream killer for this truck, though. I will need to get creative and use parts that are cheap and easy to find. This truck is going to be a driver. It’s smart to use parts that can be found at any parts store, no matter where in the country that you’re at. If you’re familiar with 1960 to 1987 GM trucks, you already know that the suspension interchangeability is incredible. 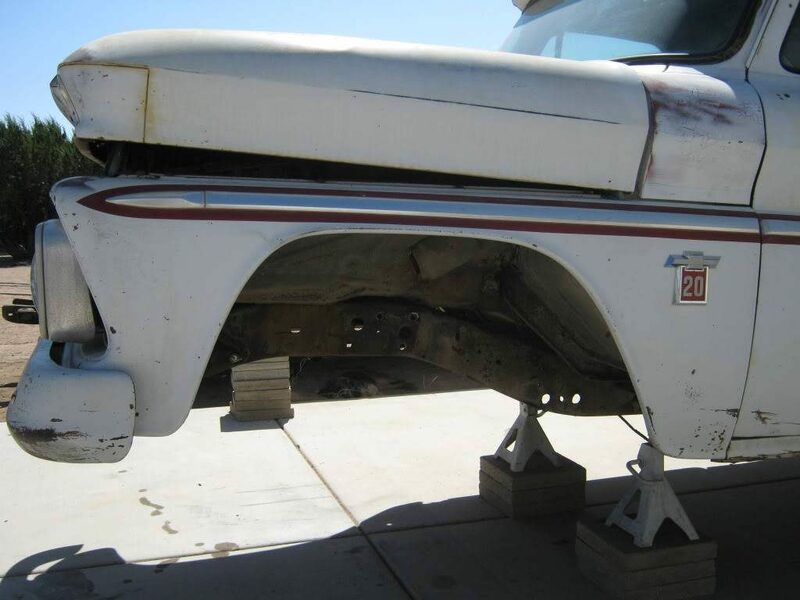 With the exception of the torsion bar equipped 1960 to 1962 models, the front suspension architecture only had few minor changes from 1963 to 1987. A great modification is to retrofit a 1973 to 1987 half-ton front suspension to the earlier trucks. This mod gives you disc brakes, a better control arm bushing design, and a substantially larger front sway bar. Another benefit is the addition of the more desirable five lug bolt pattern. If you really do your homework, it’s also the perfect opportunity to upgrade to the massive 1-ton sway bar and add power steering. You can’t beat the cost of this mod, either. Oftentimes, you can find a cheap parts truck on Craigslist or if that doesn’t pan out, there are dozens more waiting at your local self-service wrecking yards. Add some drop spindles and a pair of gas shocks and you’ve got a nice setup. The rear suspension interchangeability is a little different. 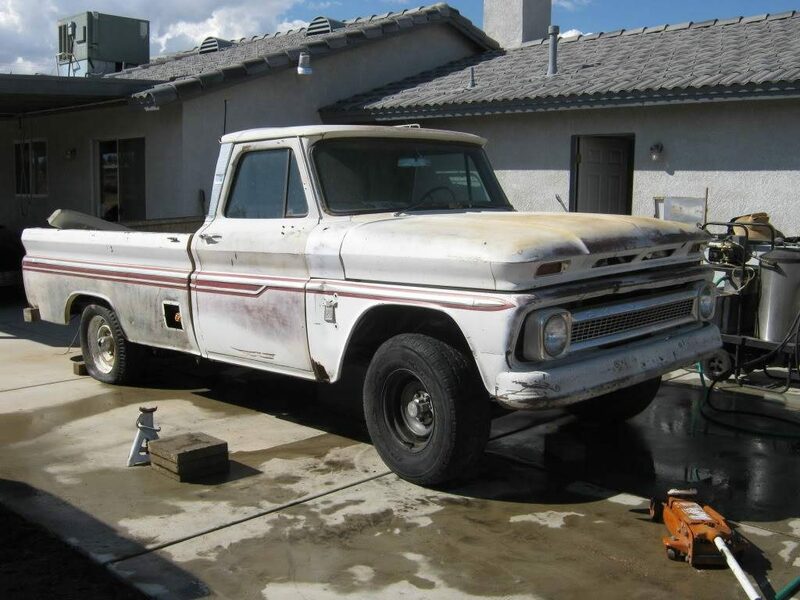 With the exception of the GMC trucks, the 1960 to 1972 trucks were a coil spring/trailing arm design. The GMC trucks of the same era were all parallel leaf spring. The 1973 to 1987 trucks were all parallel leaf spring, as well. The coil spring and trailing arm rear suspension is a very good design that doesn’t require many changes of you decide to lower the truck. A good upgrade is to find a 1971 or 1972 1/2 ton rear axle. This axle has the five lug bolt pattern and is the same width as the 1960-1966. It bolts right in with no fab work, but they are hard to find. Add some drop coils and a longer track bar, and it’ll ride nicely. 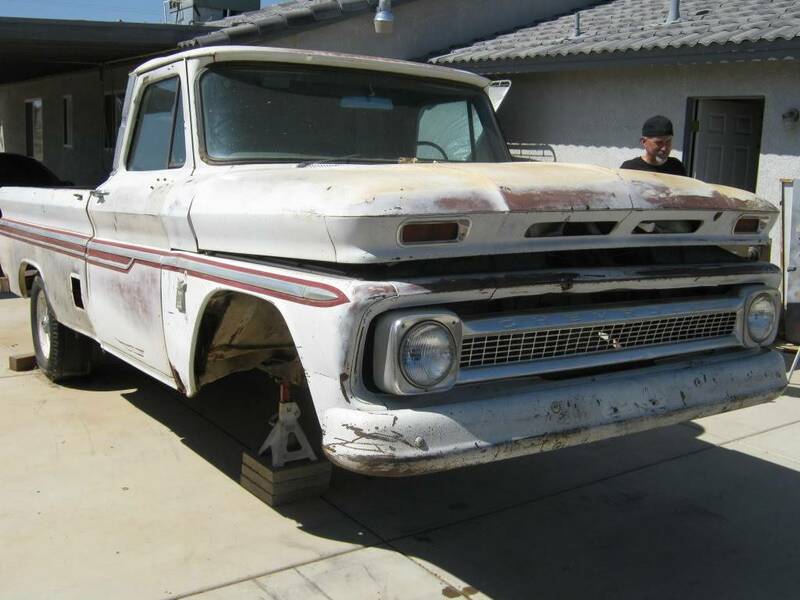 Now that I have quickly explained the GM truck front and rear suspensions, let me show you what I did for the front suspension on the ’64. About a year before, I bought a 1979 1/2 ton Suburban primarily for it’s 454/th400 engine and transmission. I wound up trading the drivetrain for some other parts, so the remains of the Suburban became my suspension donor. Both the donor and the patient were lined up side by side and the operation began. The ’64’s original 8-lug suspension put up one hell of a fight, but it finally relented and came out. The disassembly of the Suburban’s suspension was next on the agenda. Once the Suburban suspension was removed, it was the perfect time break out the steam cleaner and remove the decades of caked on grease. The grease was so thick that it peeled off in layers like cheese. After a solid hour of scraping and blasting, it turned out nice and clean. Now that the donor suspension was clean, it was time to mate it up to the ’64. 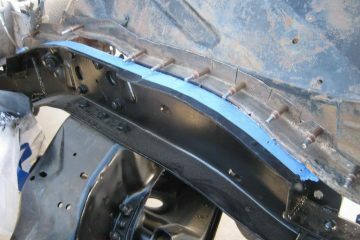 The front suspension is held in place with a total of 14 bolts. The 1979 front suspension bolted right up to the 1964 in 10 of those 14 holes. The remaining holes were easy to remedy. Two of the holes required match drilling the hole pattern of the 1979 to the 1964 frame. The remaining two were already there, but needed to be slightly elongated to match up. Once the 14 bolts were torqued to factory spec, the wheels were bolted on and the truck was lowered to the ground. It sat like a Gasser, but that will be fixed in future episodes. 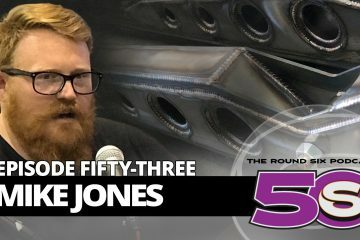 Stay tuned to the next episode, where we address the rear suspension. 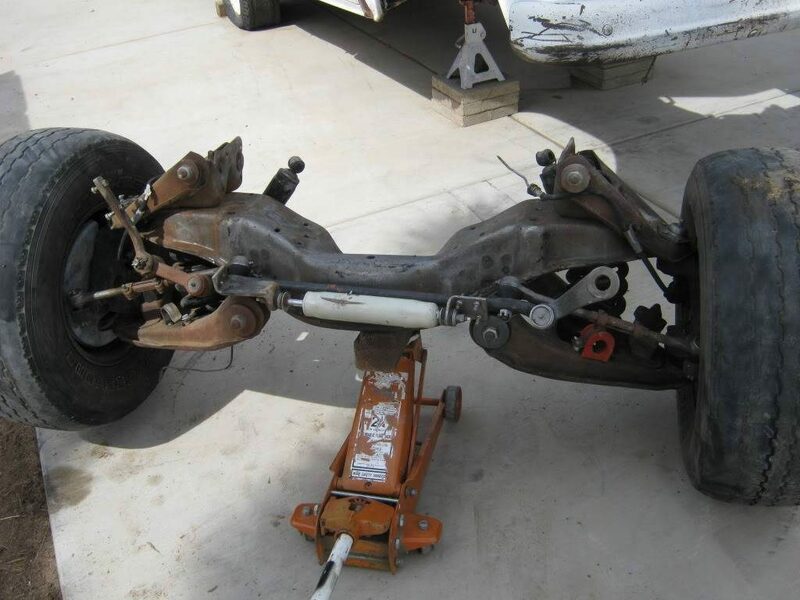 In order to stay within the budget, I’m going to use the 12-bolt rear axle from the donor Suburban, with the help of some aftermarket parts.